The Pops Gustav Archive: When is an Archive Not Archival? No, that’s not a riddle and if you don’t care at all about comic books, you probably aren’t gonna wanna read this. 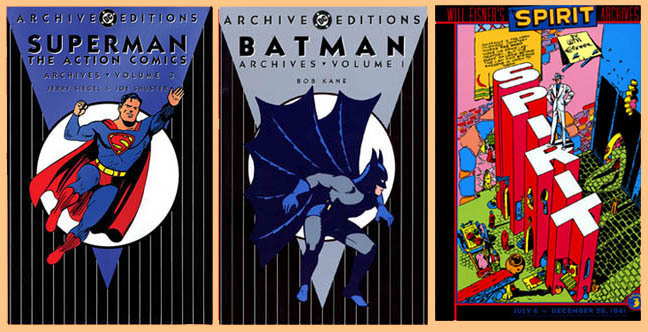 Cuz I’m gonna whine about the current state of comic book reprints, particularly DC Comics Archive Editions. Whoops, I lost some of you already. 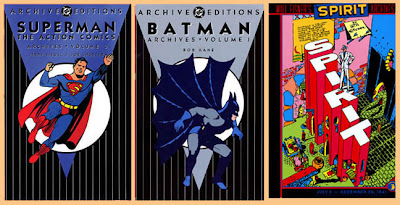 If you’re still with me, then perhaps you’re familiar with DC’s Archive Editions series. 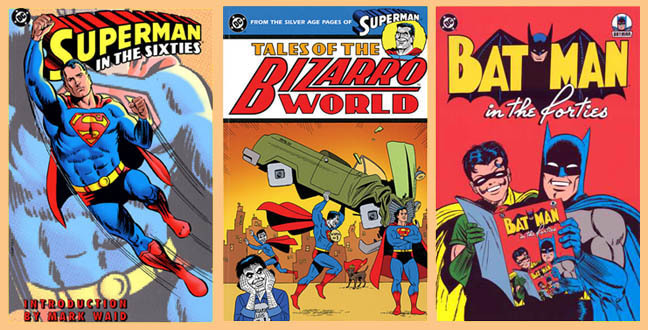 Chronologically reprinting classic comic book series from the beginning, these expensive hardcovers have been going strong since the first SUPERMAN ARCHIVES book in 1989. Those early books were particular travesties, mostly due to newly redrawn artwork (traced from the original) being used in place of actual page and cover reproductions. Computer technology has allowed DC to more successfully “clean up” the art for reproduction, but is that a good thing? I side with designer / fanboy Chip Kidd in his preference for authentic reproduction of old comics, warts and all. To me, part of the appeal of old comics is crappy printing on crappy paper: Off register color, visible ben-day dots, fuzzy lines and a paper that was at best cream colored, never pure white. But the Archives contain none of those things. 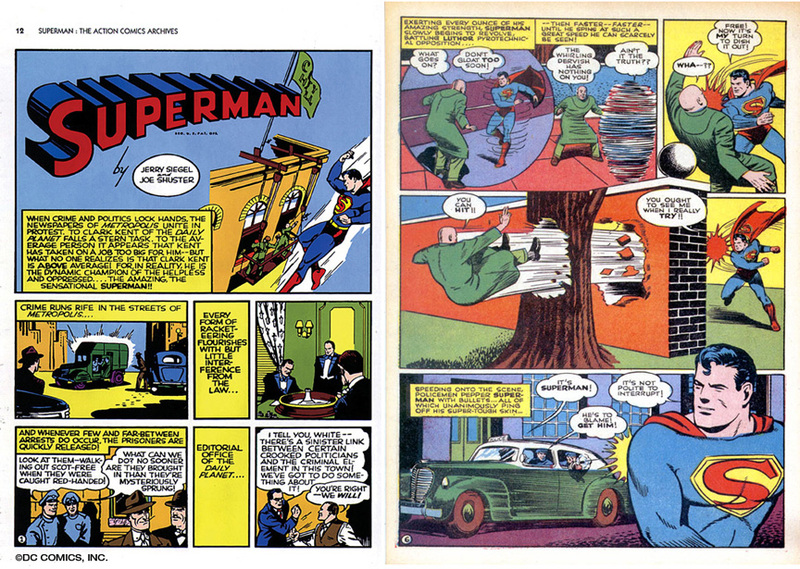 They’re printed on a glossy white paper (the exception being Will Eisner’s SPIRIT ARCHIVES ) with computer color that is clean and dot-free. Nothing is off register and backgrounds will sometimes feature color effects and gradients that would have been impossible in comics before recent years. The effect is not unlike how it felt watching a colorized version of IT’S A WONDERFUL LIFE back when that regrettable trend was in fashion. Click on the two samples below to compare what an Archive page looks like compared with a reprint of a Golden Age Superman story from the Kidd-designed SUPERMAN: THE COMPLETE HISTORY . To my eyes, the page on the right is far richer, more evocative and truer to the spirit of the original than the pristine clean-up on the left. Now, I’m not saying that the Archives should be printed on cheap newsprint, but the paper should absolutely be a matte finish, and preferably not bright white. The recent hardcover BATMAN ILLUSTRATED BY NEAL ADAMS at least got that part right, using a cream matte paper (but more later on how they screwed that book up). Almost as annoying as the paper and color is the size of the Archives. While Golden Age comic books were the same ten and a quarter inches high as today’s comics, they measured seven and a half inches across, a full three quarters of an inch wider than contemporary comic books. But the Archives are printed at the new comic book size, forcing the art to be reduced to fit, and causing an awkward disparity of margin sizes. The left and right sides of the art are crammed to the edges, while huge margins sit at the tops and bottoms of the pages. Now, obviously, this was a marketing decision by DC. The Archives need to fit on retailers' shelves alongside new comics in order to sell more books. Or do they? One would hope that books this expensive (usually in the fifty dollar range) would call to a niche market savvy enough to look beyond the New Comics section. Making the books golden age size would not only look much better, but would call to mind the era they represent. I’m not even a fan of the fact that these books are in hardbound. Call me a purist, but I like my comics under soft covers. Plus, if you’re talking about an undertaking as huge as reprinting every issue of SUPERMAN, then the less shelf space you can take up, the better. Right? Another gripe I have with the Archives is the content. While the early editions did reprint some house advertising, these days there’s usually nothing to be had other than the actual stories. Each volume contains a new foreword by some authority on comics, and some cursory creator background, but that’s about it. Wouldn’t more background material add to the historical nature of these books? Some house promos, letters to the editor, rejected covers, reprints of original black and white art (if it still existed), even ads for Daisy BB Guns, Schwinn bikes, Popsicles and Dubble Bubble would help to conjure up the time period when these comics were new. DC could even dust off some old stories from their in house zines like THE AMAZING WORLD OF DC COMICS or DIRECT CURRENTS. In this aspect, DC’s old FAMOUS FIRST EDITION series of the Seventies was far preferable to me; Tabloid sized reprints of the entire comic book, cover to cover, including all backup features and advertisements, were put under a new heavy stock cover and sold for a buck. Of course, these books caused some trouble. There were reported cases of cagey villains taking off the outer cover of FAMOUS FIRST EDITIONs and selling the reprints of ACTION COMICS #1, DETECTIVE COMICS #27 et al as the original article for thousands of dollars. As they are, the Archive Editions don’t appeal to me at all. I stopped buying them years ago, and even sold all of mine except for the first two SUPERMAN ARCHIVES and SHAZAM! ARCHIVES volume 1. At this point, DC is doing a far better job with their paperback reprint collections. I love the decade-themed Superman and Batman compilations (BATMAN IN THE FORTIES being the latest) and collections of obscure material like TALES OF THE BIZARRO WORLD or well known series like CRISIS ON MULTIPLE EARTHS offer history-minded fanboys a far more reasonable taste of the past. These books are cheaper, the paper isn’t glossy and they feature some bonus material like cover galleries and pin-ups. Sometimes the cover alone is worth the price of admission, as with LOVE AND ROCKETS ' Jaime Hernandez’ art for the Bizarro book. Why can’t they apply this care and creativity to the Archives? For that matter, why aren’t there more reprints along those lines? Lord knows, Denny O’Neil and Neal Adams GREEN LANTERN / GREEN ARROW books of the Seventies have been reprinted ENOUGH ALREADY (and are due for yet ANOTHER version this summer!). I’d love to see some BEST OF collections selecting choice material from books like ALL-STAR COMICS, THE BRAVE AND THE BOLD, THE HOUSE OF MYSTERY or one of my all time favorite comics, PLOP! How about themed compilations of genre books like war, western, romance, adventure or DC’s teen line (BINKY, DEBBI and SCOOTER)? There's some great Bob Oksner art just begging to be put back into print. If DC felt today’s fans needed further incentive to buy these books, they could take a page from some new graphic novels like CATWOMAN: SELINA’S BIG SCORE and get some choice artists to contribute new pin-up pages. Just picture a PHANTOM STRANGER collection with new drawings by Mike Mignola, Richard Sala, Charles Burns, Bruce Timm, Jordi Bernet, Eduardo Risso, Paul Pope and I guess some of those new guys that the kids these days love. 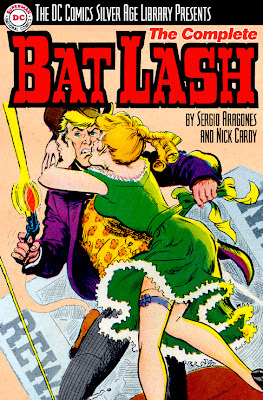 Speaking of cartoonists, how about some collections spotlighting artists? I’d say the BATMAN ILLUSTRATED BY NEAL ADAMS books were a good start if it weren’t for the fact that revisionist Adams has gone and touched up the art on all these stories, elongating Batman’s ears and adding superfluous detail. The color is also redone on these books in those jarring anachronistic tones (Adams has a severe case of Spielberg/Lucas Monkey Syndrome). There would seem to be a market for THE DC COMICS ARTIST COLLECTIONS, spotlighting stories and covers from all genres by legends such as Gil Kane, Alex Toth, Nick Cardy, Joe Kubert, Berni Wrightson, Jack Kirby, Curt Swan, Frank Robbins, Wally Wood and others. What about a collection of those Power Books and Records of the Seventies, along with a CD of the stories? The point is, DC (and Marvel, but I’m much more of a DC geek) is mostly missing the boat with its reprint editions. This aging fanboy has practically stopped buying any new comics at all (Darwyn Cooke’s brilliant and beautiful DC: THE NEW FRONTIER being a very happy exception). I’ve still got some disposable income and I’m still interested in comics... they just ain’t appealing to me. Am I alone? Since this piece, the Archives continue unabated, but DC has gotten a bit better in its handling of anthologies. While the black and white Showcase series is too far in the opposite direction, the Chronicles series (as yet reserved for Superman and Batman ) is more in line with my recommendations above. But there’s still a long way to go. The archives continue and while the early editions are now dirt cheap, they're still not worth the money. Happily, some of the books I wished for have come to pass (links provided), and the Chronicles have now expanded to include the Flash , Green Lantern and Wonder Woman . Additionally, The DC LIBRARY series is pretty good (and reprinted my all-time favorite comic book storyline, the Sand Superman saga by Denny O'Neil and Curt Swan from the early 1970s). But sadly, DC is STILL lagging behind Marvel in reprints spotlighting legendary creators (aside from Neal Adams). I agree with your article for the most part. I would love to see those old Golden Age comics reprinted with house ads and actual ads from the time. I also would like more indepth bio on the writers, artist and editors with each edition. I would also love to have more of a history of the times the comics were orginally published to put the stories more in context for the times they were printed. But do Like to have them in HC. I just like the fact that a HC if done right will hold up longer to me re-reading it over and over again.